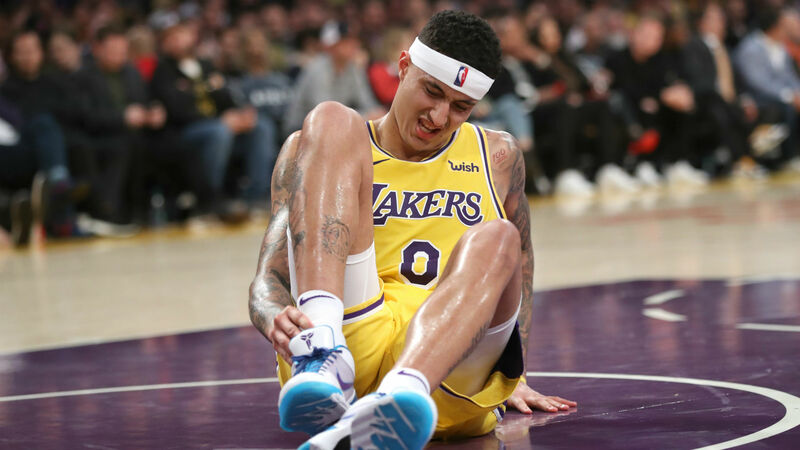 The Los Angeles Lakers could be without Kyle Kuzma for up to a week after the forward suffered a minor ankle sprain. Kuzma joined the Lakers' injury list when he went down in the final quarter of a 113-105 defeat to the Los Angeles Clippers on Monday. The 23-year-old will definitely miss the Denver Nuggets' visit to Staples Center on Wednesday and may also be sidelined for the showdowns with the Boston Celtics on Saturday and the Chicago Bulls next Tuesday. Brandon Ingram (shoulder), Tyson Chandler (neck) and Lance Stephenson (toe) are questionable to face the Nuggets. Head coach Luke Walton had only eight active bodies for an on-court practice session on Tuesday. The Lakers have only a slim chance of making the playoffs, but Walton is encouraged by the manner in which they have united in adversity. "It's been a challenge, it's been a lot of ups and downs and a lot of between on-court stuff and off-court stuff." said Walton. "It's tested us but I think we have come together as a group and that's something that only comes with time and I'm happy with the way we've done that."